Insight allows you to display 2D data referenced to shotpoints instead of CMPs if your survey contains shotpoint information. For more information about creating a survey with shotpoint referencing, see Defining A Survey in the 2D SEG-Y Loading chapter. From the Control Panel's View menu, open the 2D Line View. Right-click on the view, and select Display Settings. 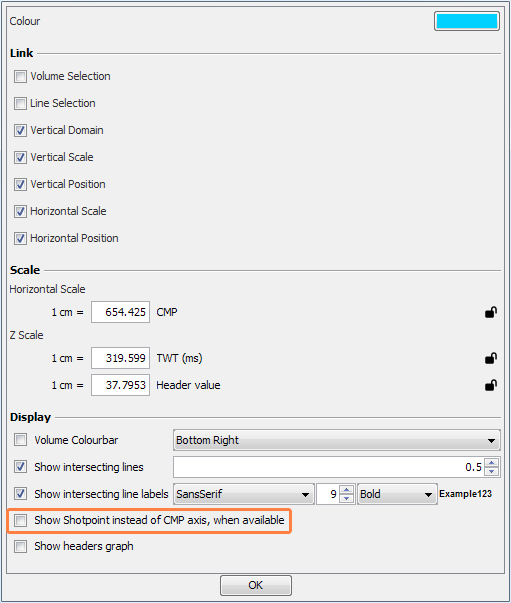 Select the Show Shotpoint instead of CMP axis, when available checkbox. With this option enabled, shotpoint numbers will be displayed along the horizontal axis in the 2D Line View and in the information bar at the bottom of the screen. If the selected line does not have the shotpoint conversion defined in the survey, it will revert back to showing CMP values.